Recreating the experience of crossing the U.S. - Mexico border is by its very nature controversial and new media artist Zulma Aguiar plunges waist deep into the fray with her interactive video installation "Turnstyle". As any tourist, day laborer, businessman, or immigrant (legal and illegal) will attest, these border crossings divide North from South. "Turnstyle" cleverly delivers the style of each side through the persona of its border agents who are portrayed by the Mexican American artist herself. According to Aguiar, "One is María and the other is Maria. The Mexican guard's name has an accent over the 'i.' When I play the American border agent, I am portraying my American self. When I play the Mexican one, I am steeped in my Mexican identity. The same white-gloved hand waves people through and keeps them from entering." "Turnstyle" represents the reality of border crossing as a transnational experience, where both sides are patrolled by Mexicans or their descendants. Exploding popular myths about any simple white/brown dichotomy. In an urban landscape unfamiliar with border life, Aguiar reconstructs an emblematic turnstile through which visitors pass back and forth, under the encouragement or harsh scrutiny of the border agents. 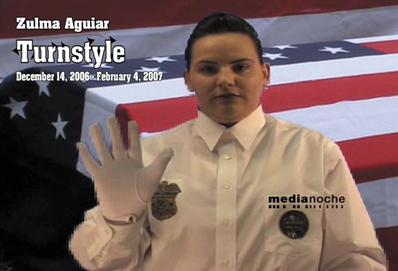 Zulma Aguiar is a new media artist from Calexico, California. She is a Masters in Fine Arts candidate at Rensselaer Polytechnic Institute where she collaborated with Aeronautical Engineer Rafael Antonio Irizarry and time-based media artist Jonathan Lee Marcus to create an interactive installation based on her U.S. - Mexico border experience.